Matthew 14 presents a powerful and practical message set against the backdrop of a fascinating experience in the life of Christ, His disciples, and His church with strong applications for us today. Burden #2. Our great need for selfless unity in Christ as we proclaim the three angels’ messages. How did Christ exhibit this comprehensive health ministry? He had landed undetected on the other side of the sea but could see the multitudes that had gathered and His heart went out to them with sympathy. Desire of Ages, page 364: “Interrupted as He was, and robbed of His rest, He was not impatient. He saw a greater necessity demanding His attention as He watched the people coming and still coming.” How sympathetic and caring are we when it comes to giving up our private time to lovingly care for the needs of others? Christ’s ministry must be our ministry. It was my privilege to visit Israel for the first time this last June for the very successful Third International Bible Conference organized by our Biblical Research Institute. During part of the conference, we stayed on the Sea of Galilee not far from where this Matthew 14 event may have taken place. It was thrilling to imagine the setting on those hillsides as Jesus met the needs of people. Verse 14 says, “….when Jesus went out He saw a great multitude; and He was moved with compassion for them, and healed their sick.” Jesus’ heart yearned to help the multitudes find the spiritual and physical healing they needed. He opened before them the comprehensive health ministry in which all of us are called to participate since it is part of the three angels’ messages. This ministry of Jesus is to be the burden of every Seventh-day Adventist. In following Christ’s work for the people of the cities, where possible, we are to work with an “in” and “out” concept as found in the Spirit of Prophecy. This expansive work will involve every church member and the use of every evangelistic resource employed in every possible outreach and witnessing activity. In every city Seventh-day Adventists should minister to people not only from their local churches but also from such centers of influence such as health clinics, vegetarian restaurants, reading rooms, counseling centers, and community service centers. Health lectures, literature evangelism, small-group outreach, door-to-door mission work, innovative media evangelism, social work that follows Christ’s methods, personal and small-group Bible studies, public evangelism, comprehensive health ministry, and a myriad of other creative outreach initiatives still to be developed through the leading of the Holy Spirit should be the hallmark of our work in the cities. This work will require the involvement of lay membership as well as established denominational ministries such as Adventist Community Services, ADRA, Adventist World Radio, Hope Channel, Adventist Book Centers, and many, many others. In this vital work of soul winning in the large cities, God is calling us to reinvigorate the use of a balanced comprehensive health ministry and unite the efforts of our denominational organizations and supporting ministries. The “out” part of the city approach involves outpost centers or small institutes in the countryside just outside the cities where city workers can live or visit to be refreshed for their work, where a simple health lifestyle center can care for guests who want to learn a new approach to life, and a place where young people can be trained for city evangelism. We need Holy Spirit-inspired strategic planning by administrators, pastors, and health professionals for every city around the world that will produce the kind of “beehive” of comprehensive evangelistic, health, and community activities Ellen White described taking place in San Francisco around 1906. This is the type of work to be done in New York City as we plan for a giant evangelistic outreach in 2013. Leaders and evangelists from the General Conference and around the world along with many local pastors, health professionals and lay members will participate in approximately 350 evangelistic meetings in the metropolitan area of New York, New Jersey, and Connecticut. Nancy and I will hold one of those evangelistic meetings for three weeks in the very location where I started my ministry…….the Manhattan Church on West 11th Street in Greenwich Village. All this will be preceded and followed-up by community outreach and comprehensive health ministry to reach New York and many other cities of the world. Ellen White declared that New York was to be a “symbol” as to how the rest of the world should be worked. Pray for this outreach that will help fulfill that prediction and be the catalyst for divisions to then reach, the power of the Holy Spirit, approximately 650 of the world’s largest cities by 2015. It was a privilege to recently join church members in New York City on Sabbath, September 22, in praying for the Holy Spirit to control comprehensive urban evangelism in Metro New York. I appeal to each of you, especially young people, to study, plan, pray and engage in God’s great plans for comprehensive urban evangelism and comprehensive health ministry. He is calling you to be part of His blended team of pastors, health professionals, church workers, and church members to show compassion on those who are weary, scattered and broken in body and spirit bringing them into a relationship with Christ. Comprehensive health ministry is meeting people’s needs in a practical way that shows them the love of Jesus whether it is sharing a loaf of whole wheat bread with a neighbor or treating a patient with Christlike kindness at one of our many technologically advanced Seventh-day Adventist health institutions. We can show Christ’s love and compassion in turning the local church into a center of life and health thus fulfilling the General Conference Health Ministries Department’s goal of making every local Seventh-day Adventist church worldwide—- a community health center. Resource materials produced by Health Ministries departments and other health entities can be used for practical Christian witnessing with church members easily sharing with neighbors the benefits of heaven-inspired health habits, preventive health strategies, and simple, inexpensive home health procedures and interventions. “Every church a community health center” is one of the most inexpensive and effective preventive health care approaches presenting healthy lifestyle modifications and “telling the world” about God’s complete plan of restoring the whole person. Seventh-day Adventists are the only ones proclaiming the third angel’s message and they will proclaim the loud cry. Changes need to take place in us and through us to accomplish this heaven-directed work. The loud cry is going to be given amid a storm of persecution which will have an effect on all of us. Counsels on Diet and Foods, page 32: “God’s people are not prepared for the loud cry of the third angel. They have a work to do for themselves which they should not leave for God to do for them. He has left this work for them to do. It is an individual work; one cannot do it for another.” Because of the close working relationship between health reform and the third angel’s message, there is work to be done in personal health before pastors and people will be given the power to proclaim the third angel’s message as the loud cry. The General Conference has established a Comprehensive Health Ministry Committee chaired by Mark Finley with co-vice chairs of Allan Handysides and Jerry Page. This committee will share at this Annual Council and in the future about comprehensive health ministry. I challenge you to go from this Annual Council committed to the practical implementation of comprehensive health ministry. Returning to that experience of Jesus in Matthew 14, allow me to share with you the second great burden I feel and I hope you do for our church at this time… that we be unified in Christ as we finish His work on the earth. Matthew 14:15 suggests that all day thousands had been watching Jesus heal people and had been fed by Him spiritually but had forgotten to eat anything physically. Evening came and the disciples urged Jesus to send the people away to buy food. But Jesus had some important lessons to teach the disciples and us today. Jesus said in verse 16, “You give them something to eat”—–An interesting command challenging the disciples to realize their constant dependence on God and not on themselves. They missed the point completely. They had self-centered, personal agendas that kept them from fully realizing God’s power in their lives. They responded in verse 17 that all that was available were five loaves and two fish. Never forget what God can do with very little if we submit to His plans instead of our own willful ideas. Jesus simply said, “Bring them here to Me.” He asked the entire crowd of probably 20,000 to sit down. Then He took the small lunch, looked up to heaven recognizing where all blessings come from, blessed the food and began the incredible miracle of multiplication……..He broke the bread and fish and it continued to produce! Verse 20 says, “So they all ate and were filled, and they took up twelve baskets full of the fragments that remained.” God is the God of the impossible! He can accomplish everything with nothing if we have faith in Him to do so. Christ had them gather all that was left showing how careful we should be to make sure there is no waste. He wanted the blessings, physical and spiritual, to be taken back to others who had not been there that day. After you have had a good day and a good meal you feel satisfied and comfortable. Desire of Ages explains that a movement developed in that large crowd which included the disciples that now was the time to crown Jesus king. If Jesus were king, who would take the positions of honor and trust around Him—–His disciples, of course. The people realized that Jesus could inspire the Jews to rebel against the hated Romans. When Jews got wounded, Jesus could heal them. When they got hungry, Jesus could feed them. When they became discouraged, Jesus could encourage them. Now was the time to proclaim Him king! But Jesus realized what was happening and in verse 22 told His disciples to get into the boat and go to the other side. He realized that if He were proclaimed an earthly king that His mission of salvation and humble submission on the cross would not be accomplished. Unbelievable! What was Jesus doing? What was He thinking? Didn’t He realize this was the best time to make His move for power? The disciples couldn’t believe their ears. Christ was frustrating their plans! He was changing their perception of power and eliminating their opportunity for advancement and status. Disgust and disunity grew in their hearts. They even began to doubt if Jesus was the Son of God. They were filled with anger and suspicion. We can see them heading to the sea shaking their heads and muttering how Jesus should have allowed the people to crown Him king! These self-willed disciples had to be brought to the point of total dependence, humility and submission to Christ. Only then could they truly be effective disciples for Him in the second burden earlier mentioned which is spiritual unity. The people were just about to lift up Jesus and proclaim Him king, when He turned and spoke with such heavenly authority that the people could do nothing but turn around and go home. The disciples, full of stormy and doubting thoughts, finally got into the boat. As they headed out into the Sea of Galilee, dissension, disunity and selfish desires clouded their hearts. The tender work of soul-winning needed in the early Christian church would never succeed with such a selfish spirit. You and I are also subject to the temptation to think that our own plans are better than Christ’s plans. Only the Lord’s love, justifying righteousness, and sanctifying power can bring us into unity and fulfill Christ’s prayer of John 17. The progressing story of Matthew 14 shows us the great implications for the church when God’s people have been fed the truth and prepared for proclaiming the message but then decide to go their own way instead of Christ’s mission. This causes disunity and disruption. What happened next? Jesus was left alone and verse 23 tells us, “And when He had sent the multitudes away, He went up on the mountain by Himself to pray.” You see, Jesus knew His real power did not come from people making Him king, but from the quiet time spent in prayer with His heavenly Father. It is the same place from which our power will come……quiet time with the Lord in study of the Bible, the Spirit of Prophecy and personal prayer. From that mountain top, Christ could look on His disciples and the Sea of Galilee. The minds of the disciples were full of spiritual darkness and as The Desire of Ages says (page 380), “Their thoughts were stormy and unreasonable….” They questioned if Christ was an imposter. Cynicism, skepticism, defiance, and selfish independence are intoxicating. If not checked, they can take people into false rationalization and self-deception which is what happened with the disciples and which can happen to us. The disciples had fallen into sullen anger and darkening doubt. The disciples needed revival and reformation. Christ in His compassion prepared a special storm to take their minds off themselves and put the disciples into a humble setting where Jesus could again speak to them with clarity. Many times God does this for us when we are headed in the wrong direction. Probably many of us have experienced that in our own lives. Verse 24 tells us that “the boat was now in the middle of the sea, tossed by the waves….” In this terrible storm, the disciples tried everything to save themselves. As experienced fishermen they probably tried to set the sails just right and throw things overboard to make the boat lighter but finally gave up! This storm was unusual and they resigned themselves to dying. Finally when they had been humbled and realized they could not save themselves, Jesus could go to them. Never think we can save ourselves by our own efforts…..we are to be constantly dependent on Christ and His righteousness for our salvation and for instruction as to how to work together in whatever situation we find ourselves. Our future work in the mission of this precious Advent movement is based on humility and recognition that we are to press together and not act unilaterally or independently as the disciples had been attempting to do. In order to unify them, the Lord had to bring His disciples back to a quiet realization of His role as Savior. I suppose Peter thought he was going to die anyway, so why not try it. I can just see him looking out at the sea, hanging onto the side of the boat and putting one foot out. It didn’t sink. He put the other foot out and let go of the boat. He was standing on the water—-something humans don’t do! He looked at Christ and began walking on the water. Impossible! Amazing! The Desire of Ages indicates that in Peter’s self-satisfaction, he turned his head to look back at his friends to make sure they were watching what he was doing. He took his eyes off Jesus. At that time a wave came between him and Christ and he began to sink. How often do we count on our own personal self-confidence instead of humbly keeping our eyes on Christ. As Peter sank, he cried out, “Lord, save me!” Jesus could have said, “Peter, you have a lot to learn. I think I’ll let you go down a couple of times before helping.” But, no, the Bible says in verse 31, “…..immediately, Jesus stretched out His hand and caught him….” We serve a Savior who never sleeps on the job……never is far from us……always ready to immediately reach out to us. Jesus pulls Peter out of his self-centered predicament. Peter and Jesus walk back to the boat with Peter holding Christ’s hand in complete trust. As they enter the boat, the wind ceases. The Creator God who commands the wind, the sea and the universe was in control. Immediately, the humbled disciples who only recently were doubting Christ’s very divinity, bowed in complete submission to Him, saying in verse 33, “Truly You are the Son of God.” The God of the universe was in full control and He is in control of His church today. Is He in control of your heart….of mine? Never doubt that God is in control. Unity will be preserved by God Himself as we humbly advance with the great mission of proclaiming the three angels’ messages. He will lead us into complete victory as we keep our eyes fixed on Christ and His plans in the Bible and the Spirit of Prophecy. His church will not fail. The Ellen G. White 1888 Materials, page 45, provides wonderful counsel for unity: “It is the word of the living God that is to decide all controversies. It is when men mingle their own human smartness with God’s words of truth in giving sharp thrusts to those who are in controversy with them, that they show that they have not a sacred reverence for God’s inspired word.” I speak to myself as well as to all others that in whatever discussions take place, let us always say things in a Christ-like spirit and with respect allowing the Word of God to decide all controversies. Let us follow the pattern of the early Christian church in the Book of Acts where they came together in one accord in prayer, study and humility. A few days ago, the senior leaders of the General Conference and the North American Division convened for a full hour simply to pray. Last week, the top leaders of the General Conference and the world divisions spent more than a day in Bible study, prayer, singing and Holy Spirit-led discussion. God has told us to press together in the proclamation of the Advent message. The other day, five General Conference employees who are Prayer Committee members came just to pray with me…..Delbert Pearman, Lily Snider, Jaya Singh, Ian Nugent, and Joy Alexander surrounded me in prayer. What a precious experience to have friends pray for you. Let’s spend more time in earnest prayer together and alone. We look forward to a unifying Annual Council as we pray for each other and follow Biblical principles in how we work together. Many of us have fallen into the temptation to criticize, berate and tear down. At times we may act independently and unilaterally tempted to maintain our own way instead of working together. Christ calls for us to come together and focus on the mission of the church even if we don’t agree with everything that the church votes. God’s church is bigger than our own personal opinions. We are to humble ourselves before God and each other in gratitude for allowing us to be part of such a mighty Advent movement. My brothers and sisters representing the world church and those viewing around the world….never doubt——-God is in control! This is His precious church. The Advent movement has many challenges ahead far bigger than anything we may currently face. Reading the books of Daniel and Revelation as well as The Great Controversy, we see the unbelievable challenges that will face us as individuals and the church. Humanly speaking, it seems impossible to predict victory for God’s church. But fortunately we are not dependent on human power. From a heavenly and Biblical standpoint, we are more than conquerors through Jesus Christ. He will conquer evil and will victoriously bring His people through their unimaginable trials and challenges in His name and to His glory! We will declare that it was by His mighty and righteous hand alone that we overcame and can live and stand before the throne of God! God is working through His church in a marvelous way. Over the last two years, Nancy and I have visited so many of you and in various places around the world. It has been tiring but very rewarding. We have seen what the Holy Spirit is doing during “Tell the World” through revival and reformation, the 777 prayer movement, the distribution of The Great Controversy, Mission to the Cities, Revived by His Word, Comprehensive Health Ministry, and through so many other local and global church activities. God’s spirit is powerfully moving this church towards its final loud cry to the world as a unique Advent movement proclaiming the three angels’ messages. The personal testimonies of church members as to how God is leading in their lives and how they are able to share this message with others are extraordinary! People are excited and the church is on the move—-not through meager human efforts but through the power of the Holy Spirit! Pray for the latter rain of the Holy Spirit. The coming of the Lord approaches. 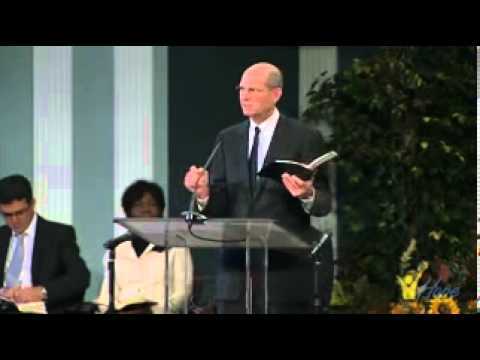 I appeal to each of us—-as church members, as local churches, as missions, as conferences, as unions, as divisions and as the General Conference—-to unite in lifting up Jesus, unite in proclaiming righteousness by faith in Christ, unite in pointing people to the mighty Word of God as it reads and urging them to read it daily, unite in our Biblical beliefs, unite in reading the Spirit of Prophecy, unite in earnest prayer, unite in sharing the sanctuary message, unite in proclaiming the three angels’ messages, unite in the loud cry, unite in revival and reformation through God’s power, unite in pleading for the latter rain, unite in sharing The Great Controversy and other precious publications, unite in Mission to the Cities, unite in personally sharing God’s message using every possible method including integrated media and internet evangelism, unite in accepting heaven’s messages of comprehensive health ministry and health reform, unite in following God’s last day commands for His Advent movement, unite in working together as we have collectively agreed to do under God’s guidance, unite in submission, humility and respect before the Lord and each other, unite in daily living out the practical ministry of Jesus in loving service to others, unite in believing that the Seventh-day Adventist Church is God’s remnant church, unite in the heavenly prophetic messages given in the Bible and the Spirit of Prophecy, unite in the love and grace of Christ, unite in the grand mission entrusted to Seventh-day Adventists to “Tell the World” that the last days of earth’s history are unfolding before us………and unite…….in actively proclaiming the second coming of our Lord and Savior, Jesus Christ…..and….He….is….coming….soon!! I invite you to seal that united mission for Christ by praying together two by two and I will close to finish our service together. Go on God’s mission united in His love, His Word, His righteousness and His peace. Amen.